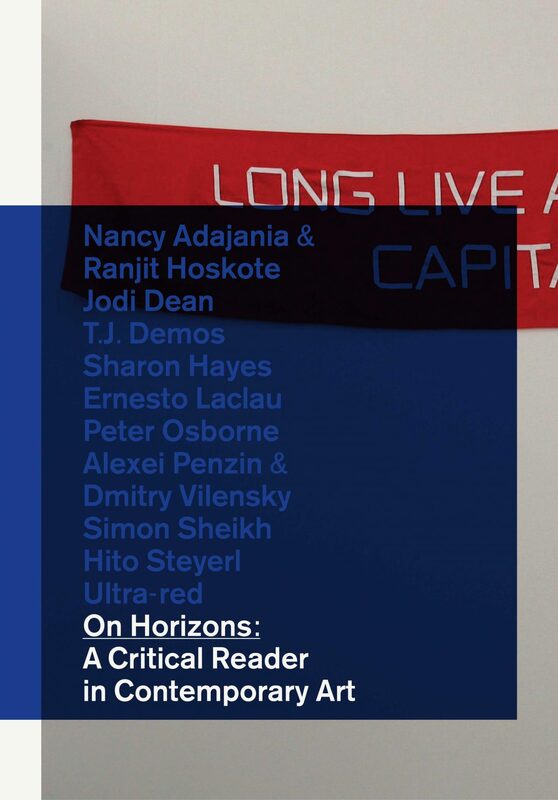 On Horizons: A Critical Reader in Contemporary Art is the fourth publication in the BAK Critical Reader Series. On Horizons explores the theoretical notion of the horizon and the linkage between contemporary art and political imagination. It examines whether the horizon, commonly taken to be the “line” demarcating that which is beyond reach or declared impossible by the dominant order, could be recharged—via artistic and political imaginaries—with potentially liberating significance. A diverse range of speculative new texts by artists, philosophers, theorists, and art historians examine the genealogy of the horizon in philosophy and art, explore how today’s neoliberal hegemony has been produced at the expense of a loss of a horizon of change and difference, and consider how art works and exhibitions set up certain horizons and thus partake in the production of the political. The reader is conceptually linked to FORMER WEST Research Exhibition Vectors of the Possible, curated by Simon Sheikh, BAK, Utrecht, 2010 and On Horizons: Art and Political Imagination, the 2nd FORMER WEST Research Congress, Istanbul, 2010. With contributions by: Nancy Adajania (cultural theorist and independent curator, Mumbai) & Ranjit Hoskote (cultural theorist, poet, and curator, Mumbai); Jodi Dean (political theorist, Geneva, NY); T.J. Demos (art historian and critic, London); Sharon Hayes (artist, New York); Ernesto Laclau(political theorist, Buenos Aires and London); Peter Osborne (philosopher and writer, London); Alexei Penzin (philosopher and writer, London and Moscow) & Dmitry Vilensky (artist and writer, St. Petersburg); Simon Sheikh (curator and theorist, Berlin and London); Hito Steyerl (artist, Berlin); and Ultra-red (art collective, Los Angeles and New York).